Community events and activities for the weekend of April 1 – 3. Got an event we didn’t know about? Please add it in the comments! Dreamtime refers to the Australian aborigines’ idea of Creation. Local photographers Aimee Friberg and Tabitha Soren explore the issue through art. More info here. The benefit features authors Michael Lewis, Kelly Corrigan, and Beth Lisick, as well as musicians The Family Crest, HYIM, and Megan Slankard. For tickets click here. Cost: $50-$250. More info here. “’Ful,’ Egypt’s national dish made of mashed fava beans, will be served together with roasted goat at Friday night’s event at the Oakland Museum of California, when ‘April Ful’s Night’ visitors will share a communal meal and talk about the latest developments in the Middle East.” Oakland North’s Felix Irmer has the whole story, here. Telegraph Avenue corridor: 19th Street to 48th Street. A monthly “First Friday” of gallery showings and street performances. See this map for participating galleries. More info here. The event will feature speakers and workshops on food and food-justice related topics. Speakers include, Sasha Abramsky, Favianna Rodriguez, Pam Peirce, Julie Guthman, and Navina Khanna. Cost: $15 – $40. More info here. Cost: tickets range from $9 to $200. More info here. Bob Seger Tribute Band is Total B.S. Total B.S. is Oakland’s own Bob Seger tribute band – playing works from the great’s entire career. Jesse Morris & the Man Cougars, Guitar Wizards of the Future, and Mick Leonardy will also be performing. 21+ only. More info here. National leaders from both the education and faith fields will lead five talks over the course of the day long conference. Cost: $40. More info here. New and used construction and home improvement materials will be on sale all weekend. Friday is only open to contractors and wholesalers, but Saturday and Sunday are open to the public. More info here. The show – one of the biggest comics and popular culture events in country – is celebrating its 25th anniversary. The event includes panels from the comic industry’s big publishers, vendors selling everything pop culture, an artist alley, games, and workshops. Cost: children 11 and under are free with PAID adult badge, juniors are 12-17 years old and seniors are 60+. More info here. Escapist Comics – a new comic book store in Berkeley – is celebrating its grand opening by holding an after party for WonderCon. Special guest Paul Levitz – the former president of DC Comics – will be signing copies of his new book, “75 Years of DC Comics: The Art of Modern Mythmaking.” There will be free drinks and snacks. More info here. Put on your silliest hat and join San Francisco’s 33rd Annual St. Stupid’s Day Parade. There will be four ritual stops: The Federal Reserve Bank – HQ for the ritual of the Dead Lottery Ticket, The Pacific Stock Exchange – the “Sock” Exchange, The Plaza of the Holy Lug Nuts – the Leap of Faith, and The Bankers Heart – the Penny Toss. More a map of the parade route, click here. More info here. The festival is from Thursday March 31 – Sunday April 2 and hopes to promote awareness of human rights issues across the world. On Friday, there will be four film presentations. More info here. Monique Jenkinson – Fauxnique – is a drag queen with exceptionally theatrical dancing skills. She will be performing a solo number in conjunction with San Francisco Grants for the Arts nine free performances in 2010 and 2011. Dancers’ Group and World Arts West are also sponsoring the event. More info here. Karen Benke will share tips and tricks from her book “Rip the Page: Adventures in Creative Writing.” More info here. In conjunction with the 33rd annual St. Stupid’s Day Parade, the First Church of the Last Laugh presents a collection of art that depicts the oldest of all human impulses, stupidity. Bishop Joey, the instigator of the parade, curated the exhibit. The show will run till April 30th. Saturday night there will also be a Big Stupid Party to celebrate April Fools Day. More info here. The museum is celebrating the artist residency of Carmen Lomas Garza. Danza Xitlallit, San Francisco’s oldest Aztec dance troupe will perform. More info here. 23 different businesses will be offering special deals and discounts for 2011’s Lower Haight Art Walk. There will also be food carts, live music, a scavenger hunt, and sidewalk BBQ. If you want to participate in the scavenger hunt, bring your friends (a team can be up to 4 people) and you camera to the check-in at Lower Haters. You can start the hunt at any time, but if you want to be in the running for the $100 cash prize you have to finish before 9:30 pm. More info here. Love terrible movies? Big Umbrella Studios is screening two of the worst, The Room and Troll 2. There will be popcorn. The event is BYOB and they suggest bringing your own blankets, lawn chairs, and cushions to sit on. Cost: $1 for admission, $3 pizza, $2 PBR. More info here. Christina Hutchins will read from her works, “The Stranger Dissolves” and “Radiantly We Inhabit the Air.” Jeanne Wagner will also being reading from her collection of poetry, “Body of Our Lives.” More info here. Mark Danner will be talking about his new book, “Stripping Bare the Body: Politics, Violence, War” and recent American power. More info here. San Francisco Bike Party is dedicating their fourth themed bike ride to Robots and Cyborgs. 200 – 700 cyclists will gather in Civic Center Plaza at 7:30 pm. The group will head out at 8 pm. More info here. The gathering is for women looking for revival, rejuvenation, and refreshment. The event will include educational sessions, forums, and keynote speakers. A full breakfast and lunch will be included. More info here. Mayor Quan and Jane Brunner will be holding the District 1 Town Hall Meeting at 10 am on Saturday. More info here. The Prescott Circus Theater will perform will a number of Oakland students – representing seven public elementary schools. While both shows are free, seating is limited and it is first come, first serve. More info here. The Crucible’s 56,000 square foot studio will be open to all for their Spring Open House. There will be tons of live demonstrations in welding, glass working, metal casting, and blacksmithing. Student and faculty art will be on display and drinks and snacks will be available. More info here. Shirley Masengill – a staple of the bookstore community in Oakland – passed away on February 12. A memorial to celebrate her memory will be held at Laurel Bookstore. There will be food and drinks, as well as all of Shirley’s favorite books. At 1 pm everyone will gather to tell their favorite stories about Shirley. More info here. Cost: tickets range from $15 to $1500. More info here. The alcohol-free celebration will include, free Cambodian food, Karaoke, traditional dancing, a fashion show, games, and family friendly activities. More info here. The festival promises to be a fusion of both traditional celebrations and modern customs. The day will start out with a Cambodian monk will give the customary blessings. There will be traditional food, games, a giant jumper, Cambodian dancing, break dancing, and poetry readings. Moreinfo here. Battery Chamberlin was built by the army in 1904, just above Baker Beach. The guns at the Battery were able to disappear from site, despite weighing 50-tons each. In 1977, the Golden Gate National Parks got a 97,000 pound canon – similar to those that used to be at the Battery – the last of its kind. In case of rain, please call 415-561-4323. More info here. The festival is from Thursday March 31 – Sunday April 2 and hopes to promote awareness of human rights issues across the world. On Saturday, there will be five film presentations. More info here. Ranger Linda will walk you through the events of April 18, 1906 – the day of the great San Francisco fire. More info here. Come watch the final four battle it out for the change to compete in the March Madness Championship on Monday night. Shanghai Kelly’s will be showing both games, Butler vs. VCU at 3 pm and UConn vs. Kentucky at 5:45 pm. There will be free food – until it runs out – so get there early. Although the free BBQ is only free with the purchase of a drink at the bar. More info here. Come meet other singles who enjoy there wine, and art too. There will also be appetizers to tide you over. Come dressed to impress and you may meet your new mate. Cost: $20 in advance, $30 at the door. More info here. This new event celebrates Hip Hop culture and dance at an international level. Performers from Latin America and Japan will be performing live. Cost: $10 – $12. More info here. The festival will celebrate the life and work of activist Cesar Chavez. There will be speakers, poetry readings, a hip-hop performance, tree planting and a community mural installation. More info here. The entirety of Macy’s Union Square store will be covered in flowers and decorative greenery. The show will remain open until April 10. This year’s exhibitions include: Enchanted Garden (Cosmetics Department), Whimsical Topiary Garden (Fragrance Department), Rooftop Garden (Watch Department), Tropical Rainforest (Handbag Department), and a Zen Garden (Jewelry Department). If you bring your Flower Show brochure to the 6th floor Visitor Center you can receive 10% off for the day. For daily events, click here. More info here. Bring your bike and your tools and learn how to fix your bicycle’s flat tire. More info here. The spring sailing season will commence with the Cal Sailing Club’s Open House. Anyone who wants, will be treated to a free 20-minute ride on sailboat with an experienced sailor. There will a sign up in front of the Cal Sailing clubhouse. Please bring a strap for your sunglasses and a change of clothes in case you get wet. More info here. Laura McCreery – author of “Living Landscape: the extraordinary rise of the East Bay Regional Park District and how it preserved 100,000 acres” – will show slides and lead a discussion of the history of the East Bay Regional Park District. More info here. Famed soprano Jessica Rivera comes to Berkeley to perform a number of pieces, including a West Coast premier. Rivera – accompanied by Molly Morkoski – will perform Schumann’s Fraulenliebe und Leben and Debussy’s Ariettes oubliees. The West Coast premier will be Mark Grey’s Atash Sorushan. Cost: $48. More info here. The Incredible Shrinking Orchestra takes large masterpieces and re-works them for smaller groups of musicians. There will be two performances on Sunday, guitarist David Tanenbaum will perform Gariela Lena Frank’s Inca Dances and Vivaldi, and the Orchestra will play Stravinsky’s The Rite of Spring with only 14 musicians. Space is limited so reserve your free tickets here. More info here. 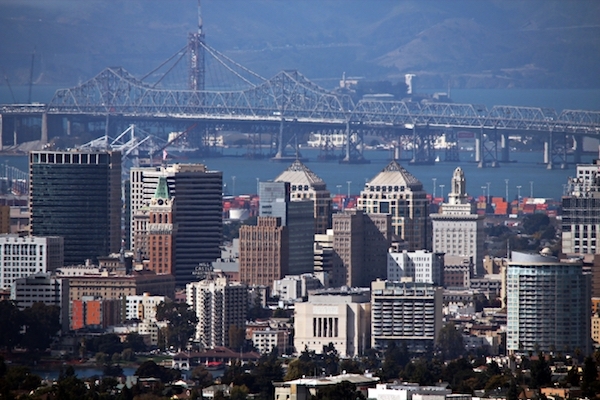 Got an Oakland event to share for next weekend’s events listing? Send info including address, time, and ticket price for events taking place in Oakland between April 8-10 to staff@oaklandnorth.net.